« Big Red Bus Visit!!! 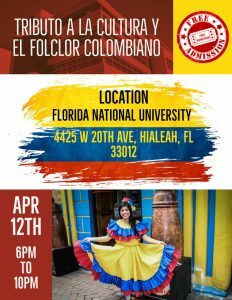 Join us on April 12th from 6:30-10pm at Florida National University as we celebrate and recreate the world famous Colombian Carnival. Admission is free so make sure you brings friends and family for a night full of dance and fun. You won’t wanna miss out!